Direct Drive as the name implies is a motor that directly drives the wheel. Copper wire is wound around the poles which is fixed to the center and are stationary with the axle. 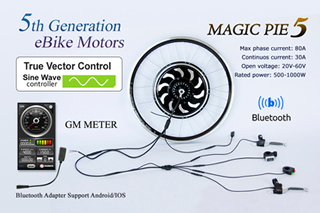 The rotating hub attached to the spokes has a series of powerful magnets. To produce the torque to propel the wheel a DD Hubmotor favors larger diameter and as many poles as possible. As there is open space on the inside, some DD Hubmotors have the motor controller integrated inside the hub. That adds convenience for connecting the cabling but also adds heating from the electromagnetic poles to the controller. Normally integrated controllers have thermal sensors which scale back power to avoid damaging components. While this is generally the most reliable method of construction, it also tends to reduce hill climbing duration. Hubmotor cables may be routed through the axle center or just offset to the axle. Its better to have the cables exit the side opposite the chain to avoid unexpected contact from chain whip. Most Hubmotors use a larger sized axle with flats milled and absolutely should have a Torque Arm installed. Efficiency is pretty good at speeds over 10-12 MPH and can be as high as 90%. As speeds drop below 7-8 MPH the efficiency falls off quickly. DD Hubmotors are the best choice for commuters who are putting many miles on their trikes, and the best choice for those looking for higher speeds say over 15 MPH. If you want to cruise with the roadies you'll definitely want a DD Hubmotor. While they can be used to assist climbing hills for shorter distances, elevations beyond about 200 feet of ascent or on grades above about 8% they fall off quickly on efficiency and begin to generate heat. Larger sized DD Hubmotors can overcome the hills but at the expense of weight. Even then, you'll need to keep up the speed to say above 8-10 MPH. Reverse is a feature available on some DD Hubmotors. Regen Mode has a switch connected to the brakes that signals the controller when the brake is applied. On braking the motor applies a selected level of braking force electrically which process current that charges the battery. Its really a nice feature on long descents as you'll be both charging the battery and keeping wear off the braking system. But don't expect a lot of recharging, typically gaining back 5% of the power consumed from Regen is a pretty good number. 10% Regen is practically unheard of. Cogging is what you'll feel when the wheel is rotated between poles with no power or Regen applied. It's a form of drag that increases with speed. Also increases with motor size. At 10 MPH, its not too bad on most motors, above 15 MPH on smaller motors not too bad, but larger motors its like going up a slight hill. By 20 MPH its like riding on flat tires. So in choosing a DD Hubmotor keep in mind that at speeds over 10 MPH you'll want some juice left in the battery. Some manufacturers like to make bold claims about zero-cogging effects. That's all they are is bold claims. The trouble is to reduce cogging also translates to reduced efficiency. 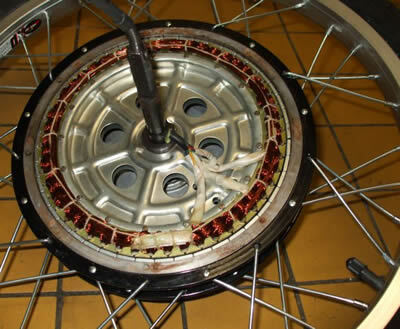 Larger Hubmotors require more current; while that doesn't add much cost to Hubmotors with external controllers it does require a larger capacity battery to supply at the required amperage. External controllers are most common, and are connected to the motor with a minimum of 3 phase wires of a larger size (typically 12-16 AWG). Most Hubmotors also have 5 additional smaller wires for Hall Effect switches. Some controllers have built-in phase sensing so Hall Effect wires may not need to be connected, it just depends on the controller. Integrated controllers clean up cabling to the motor but still require cabling to the battery, throttle, display, and brakes. Reliability is where the DD Hubmotor really shines having the fewest moving parts of all Electric Assist systems. DD Hubmotors are the least expensive E-Assist systems to manufacture. They are also produce the lowest audible noise as far as the motors themselves go; however the motor controller also has a significant effect on the level of noise. Weight is typically between 10-16 lbs (before mounting in a rim) which requires a very sturdy wheel build. As heavier wheel assemblies can intensify pinch flats Hubmotors weighing over 10 lbs are not recommended for high pressure road tires less than 1-1/4" wide. You'll notice the short stout 12 gauge spokes which aren't as elastic as longer, thinner spokes used on standard hubs. Freehubs and Freewheels are two different types of sprocket cassettes. Back when 7 speeds were state of the art, hubs used a screw-on Freewheel that was an assembly of the 7 sprockets and ratcheting carrier that screwed onto the hub. As 8 speeds came into vogue Shimano and SRAM agreed on a standard for a new design where the ratchet component was integrated into the hub and the sprockets were packed as a "cassette" to fit onto a splined shaft extending off the hub. In the bicycle world most folks adding E-Assist don't care much about shifting and with the added power some might even say 7 gears is too many. As a result many of the Hubmotors are designed to fit a screw-on Freewheel rather than a standard cassette. Moreover it wasn't until about 2014 that anyone even made a 10 speed version of a screw-on Freewheel. 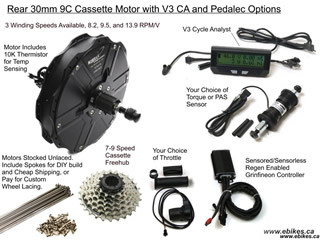 Now they are available so those with 10 speed drivetrains can use a motor designed with either a Freehub or Freewheel. Dropout Width is the distance between the Dropouts and needs to be considered. Most Hubmotor drawings show a Dropout Width of 135 mm which is consistent with most trikes and Mountain Bikes. Of course that's with just enough room to fit an 7 Speed Screw on Freewheel or with the Freehub style, an 8 speed Cassette. Going to a 9 or 10 speed adds another 4-5 mm width with a spacer 12 mm ID x 20 mm OD. You may need to spread the Dropouts by 3-4 mm. 1st Cut was a process of researching among over 100 different Electric Assist packages for OEM technical specs and using on-line simulators from Grin Technologies and ElectricBikeSimulator to narrow down a handful of motors. Also information was scrubbed from the Endless Sphere Forum. This part alone took about 6 months. The 1st Cut narrowed the best contenders down to 5 contenders to make the best of class rating for a recumbent trike application. 2nd Cut involved actually test riding all 5 units; unfortunately they were all on DF bikes, but that was good enough to get the feel of how well they worked. After the test rides were taken the field was narrowed down to two products. The Smart Pie 5 is a smallest and lightest system in the lineup. Equipped with an Integral Sine Wave Controller its nearly silent. This system is ideal for a Catrike 700 (note dropout width) or Expedition rider who wants to ride with roadies. Will give some boost on small hills, not much good for grades over 7%. Has a Bluetooth interface and an Android App that turns smartphone into computer. No speed limit and can propel a typical trike to about 23 MPH without pedaling. Cogging is undetectable below 11 MPH. Golden Motor designs and builds a quality product with excellent customer satisfaction. Magic Pie 5 is a stout motor having a large diameter high-pole count rotor with a narrow outer hub edge. More efficient then its little brother the Smart Pie; it will go further on less power. It is quiet not as near silent as the Smart Pie; but heavy. This motor can top 30 MPH on an HPV FS26, and does a pretty good job on hills. You can really feel the cogging at speeds above 10 MPH, so plan on always having juice in the battery. Excellent choice for commuting; very efficient at speeds over 15 MPH and not bad down to about 6 MPH, due to the high pole count. Flagship E-Assist product for Golden Motor. This is a fully equipped package from Grin Technologies that includes the Cycle Analyst 3 (CA3) computer and Thun Torque Sensing Bottom Bracket. 9C builds a stout motor and includes a Cassette friendly Freehub. The external controller allows a sustained 1500 watts. This motor can easily push 32-35 MPH and climbs hills just fine, although like any DD, it won't climb as efficiently as a geared motor will. However like all DD motors cogging is very noticeable at speeds above 12 MPH. Equipped with the CA3 and Thun, it takes Pedelec to a whole new level. 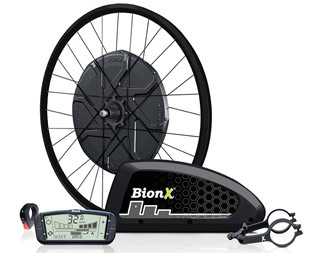 Bionx was an early entrant into the US market that focused on delivering a practical aftermarket product to the American bicycle retail industry. Having a large diameter yet thin rotor body it is a lightweight well designed motor package better suited for speeds of 12-20 MPH with limited hill climbing boost capability. The lighter weight lacks the copper mass to handle any extended grades over 5%. The proprietary software is not user programmable and cuts power immediately above 20 MPH. The battery has a proprietary software interface that will not enable any other brand of battery to be fitted, and there have been several issues reported over short battery life. The system is sold as a turnkey with 48V 11 AH Li-Ion battery and computer. 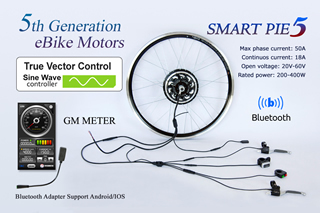 A pioneer of Torque Sensing Pedelec control they offer a great experience but compared with other offerings may be considered as significantly overpriced. Go Swiss Drive is only available through OEM Bike/Trike OEM's as a turnkey solution. HP Velotechnik chose Go Swiss as their supplier. The most silent of all, and somewhat stealthy. Very efficient at speed and on hills less then 10% grade, this is the cream of the crop. Includes reverse. Very little cogging, not noticeable below 16 MPH. Can be set to 28 MPH limit, factory setting is 20 MPH for USA. Proprietary software. Pedelec only with start-from-stop booster switch. Pricey for a turnkey package and can be ordered from HPV dealers configured for an HPV; that will fit other trikes with some retrofitting of battery mounts. While this only covers the DD Hubmotors there were several that looked attractive but lacked the quality or simply didn't deliver on the claims. Without naming them we found issues with claims over "zero cogging", power levels, reliability, delivery and general quality. Ordering overseas from suppliers that don't have firm reputability is risky. Moreover as these systems are designed for bicycles, ordering an unknown product may lead to significant challenges with cable lengths and potential returns of defective products, as well as issues with customs or other shipping delays. There are several reputable USA dealers of DD Hubmotors in the USA who distribute other brands, but frankly I'm not going to spend the $$ and time to qualify them all.